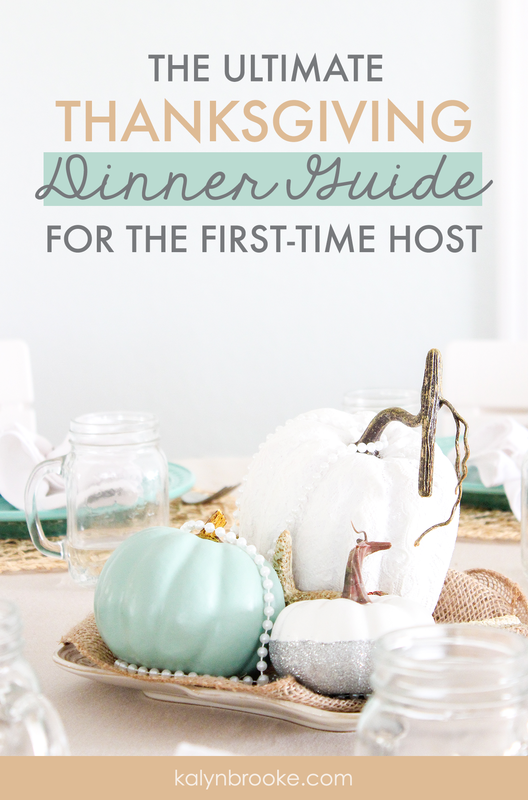 Hosting Thanksgiving for the first time? With these Thanksgiving tips, you'll know exactly how to prepare (down to the very last detail!) so you can pull off an epic but stress-free Thanksgiving everyone will remember for years to come. Last year I hosted Thanksgiving for the first time, which meant that 7 people filled my house on this very important holiday, expecting to be fed and entertained! Even though that's not a huge number compared to the epic Thanksgivings my grandmother has hosted for our very large extended family every year, to say I was nervous would be an understatement. Especially since grandma would be one of my special guests. I may have gone a little bit (okay, a LOT) overboard with careful planning and preparation in the weeks leading up to the big day, but because of my compulsive attention to detail, I was able to pull off an almost-stress-free-and-flawless first Thanksgiving as hostess. If you're hosting your first Thanksgiving and terrified of doing it wrong, consider this your guide to a smoothly run holiday from someone who feels confident she could do it again. 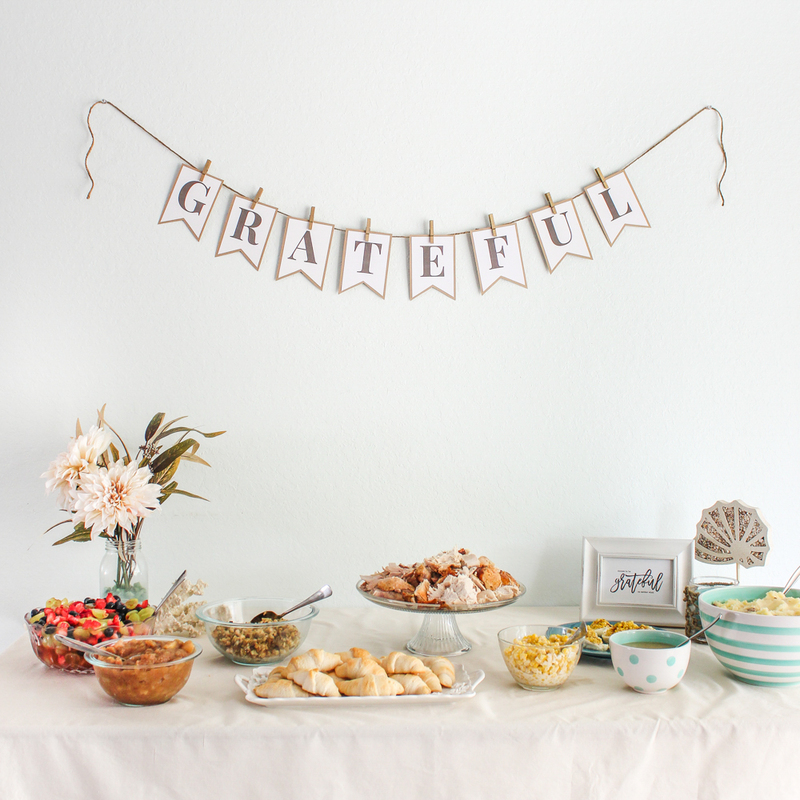 Hosting Thanksgiving for the first time? 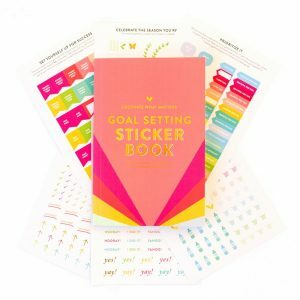 This printable will make your planning a breeze! If you've been following my blog for any length of time at all, you know I'm a big believer in planning ahead. No less so when it comes to hosting Thanksgiving for the first time! Planning reduces the chance of forgetting anything—and also makes sure you get everything done before and on the big day. This step involves more than just quickly listing out the menu. That's the easy part! It's the turkey that requires extra preparation. I'll be honest—the turkey completely intimidated me (which is why I was so happy to have Grandma nearby to help). Pro Thanksgiving tip: I wish I'd realized you can totally make the turkey the day before, avoiding any mishaps and a lot of that day-of stress! For the rest of the menu, pick dishes that will be easy to make (there's no gold star awarded for the most complicated!) and have some dishes to assign to others if/when they ask what they can bring. Keep in mind substitutions for any dietary restrictions too. Ahhh, decorations. Totally not necessary, but it's such a fun excuse to dig into all the projects you've saved on your Pinterest boards! I also went a step further and chose a theme (coastal with aqua and natural accents) to make sure everything fit seamlessly together. Using a theme made it a LOT easier to narrow down on what decorations I wanted to make and/or display. 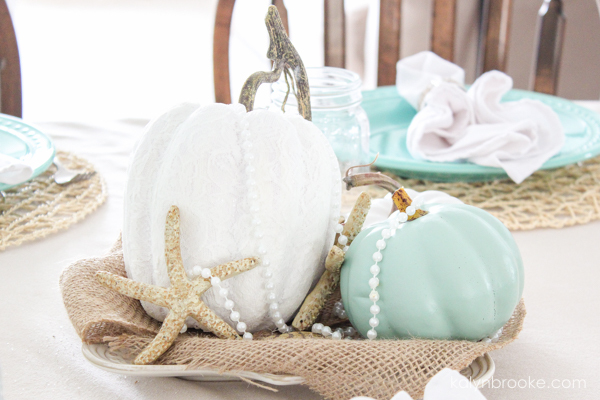 Pro Thanksgiving tip: If you're making decorations, I recommend you make these way ahead-of-time, unlike what I did with my three DIY decorating projects—although there is hope if you wait until the last minute because then early arrivers can assist! Of course, you do not have to do any of this, and if decorating stresses you out, skip this part. But you may just find (like me!) that this is your favorite part of the planning process. You don't have to plan every minute of the day, but it's good to have a few activities on hand (especially for kiddos) so everyone continues to have a good time and doesn't get bored. For the kids, assemble an Activity Bin ahead of time. 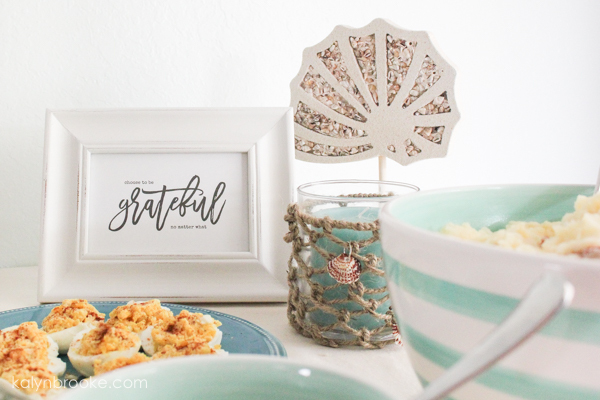 You can even add some Thanksgiving-themed crafts inside too! 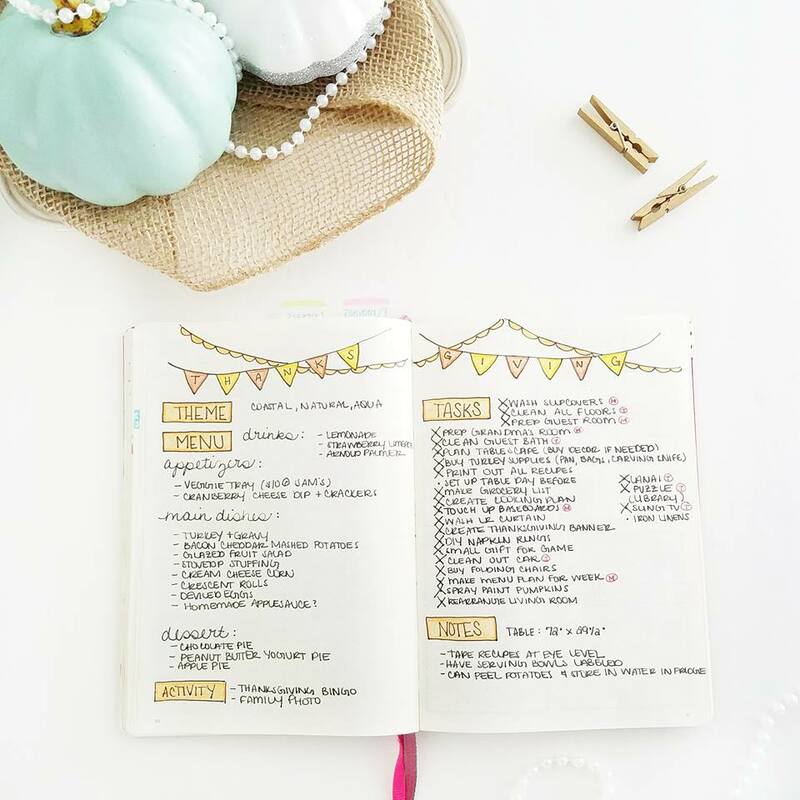 Lastly, plan out everything you need to accomplish each day the week of Thanksgiving, (i.e. cleaning, grocery shopping, meal prepping) so it's out of your head and onto actual paper. Because there was SO much to remember, I created a two-page spread in my bullet journal to keep track of everything. The day before Thanksgiving, you'll want to do as much as you possibly can to avoid the frantic scramble right before the big meal. Take it from me—I crossed so many things off my list that we didn't have all that much to do on the actual day except make sure food went into the oven at the right times! Gather and confirm you have all the needed ingredients. Not every store is open on Thanksgiving, so give yourself peace of mind and double-check just in case you need to make a last-minute run the day before. Create your day-of timeline. Calculate backward from dinner time so you know exactly what needs to be in the oven when. 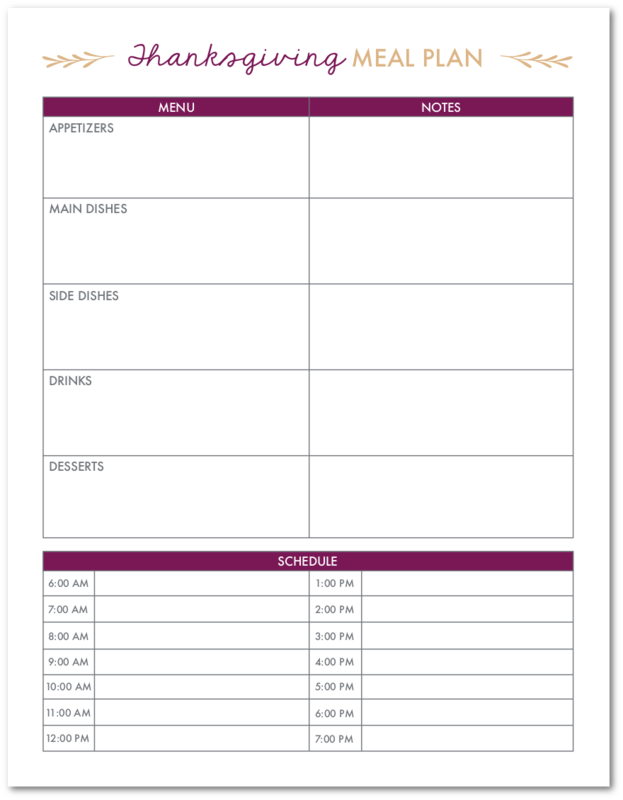 This printable will help.Also create a list of tasks you can assign to other family members. That way when they ask to help, you'll have a job all ready for them! Use washi tape to hang recipes on your kitchen cabinets. My kitchen looked a little funny, but this was super helpful to see everything I needed to make at a glance, rather than flip through several cookbooks or binders. 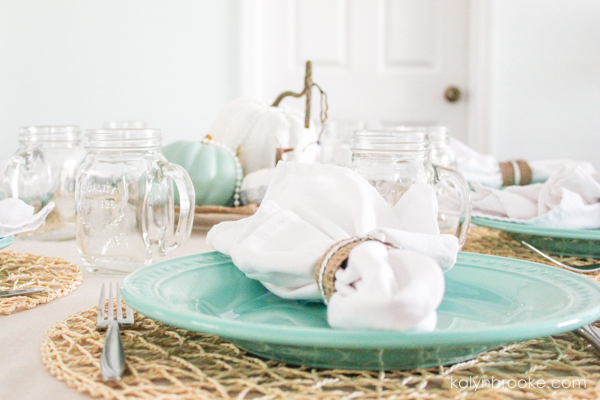 Lay out and label all food dishes (including serving ware) with sticky notes. Not only does this prevent a last-minute search for serving spoons and bowls, kitchen helpers won't have to ask what goes where. They can just look at the sticky note and give you a hand! Make food ahead of time. There's plenty of prep work to be done before the actual day. You can peel potatoes, put them in water, and keep them in the fridge overnight; bake pies; assemble dry ingredients in a bowl, etc. Clean the kitchen so it's fresh for the big day. Start with a clean slate by washing any dishes, wiping down countertops, and cleaning out the fridge to make room for yummy leftovers. Thanksgiving Eve will most likely be an exhausting day, but I promise you'll get through it! And when you wake up the next morning, you are going to LOVE being so prepared. Your guests will appreciate it too. Using the timeline you created the day before, assemble each dish, rotate them in and out of the oven, and relax in between timer sessions. You've done most of the hard work already! Now it's time to follow the plan you've worked so hard on and make sure everyone's plates, drinks, and bellies are full. And remember: the point of Thanksgiving is not to pull it off perfectly; my absolute top Thanksgiving tip to you is to give thanks and truly enjoy the people you get to celebrate with. Those mistakes just gave us extra laughs! 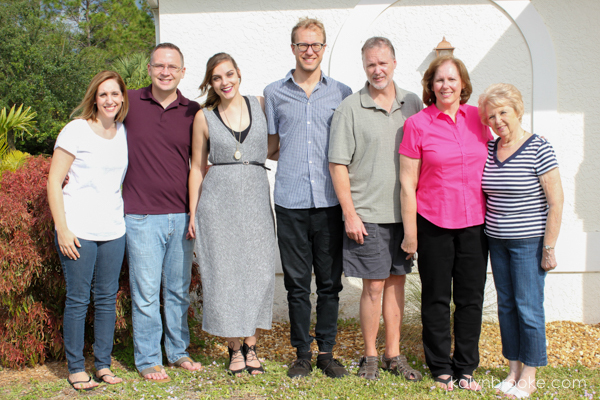 And even though my family did poke fun at me for being WAY over-prepared (we're a pretty sarcastic bunch, so I didn't mind! ), they told me later that it was the smoothest Thanksgiving they've ever had. 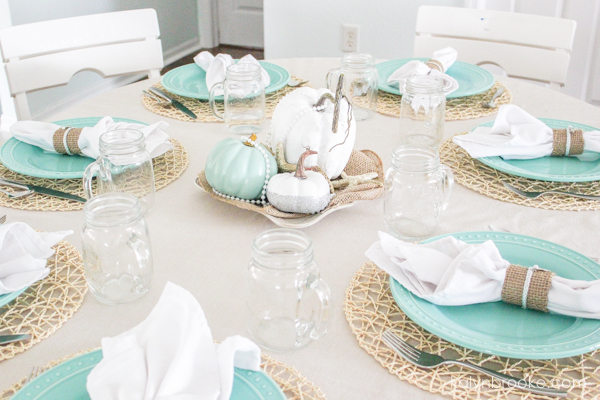 What are you most nervous about when it comes to hosting Thanksgiving this year?